To order your personalised calendars using our postal order form, simply click here on the postal order form image to the left and follow the instructions. 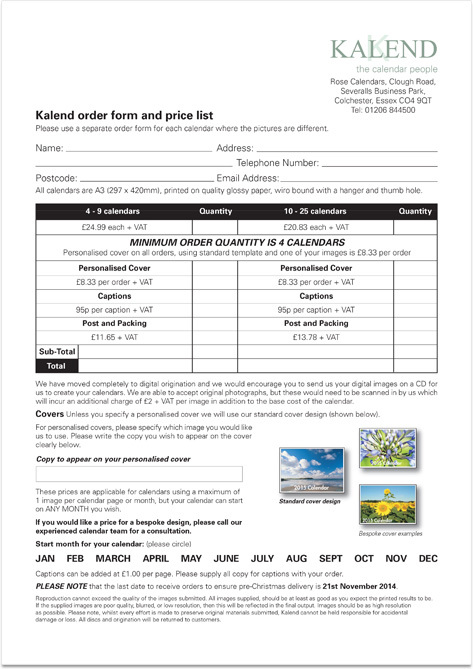 The postal order form is a PDF format document which will open in a new window for you to view, and or print. Should you experience any difficulties completing the order form, please do not hesitate to contact us and we will be happy to help you. Beautifully presented, personalised calendars for 2017 direct from Kalend, the calendar people.